Abraham, Jr. (1866) is listed as 4 in the 1870 Census and as 13 in the 1880 Census. There is some uncertainty about his story, but here is the outline of it as told by my mom. He was married. Abraham, Sr. bought the 40 acres for Abe, Jr. and his wife. They had two kids and lived with Abraham, Sr. Then Abe, Jr.'s wife left. Eva Noe said she ran off with another man. Cleora was their child, and she lived in Chicago. Cleora married a Zweisler and played the piano. She came to visit when I was 11 and played the Petite Waltz. Abe, Jr. and his wife also had a boy, Lorene thinks he died of TB. Cleora Zweisler had one boy, who lives in Chicago and was married late in life. Cleora died. Recently, we found the picture above of Abraham and his wife in an old family scrapbook. "Abe Fickeisen died in the hospital at Toledo, last night. He had been at the institution for some time, his case being incurable. He was 45 years of age and had been a resident of Galion all his life. The remains will arrive here this evening, and the funeral will be conducted by Rev. Ruf, in the First Reformed church, at 2 o'clock, Friday afternoon. The deceased leaves his widow and two children, one child having preceded him to eternity." The funeral announcement confirms some of the above, and that he was buried in Fairview Cemetery. The record of death lists his spouse as Catherine Schupple and lists the name of the deceased son as Arthur Benjamin Fickeisen. Regardless of some inconsistencies, I think it is very probable that this is the ninth child of Abraham and Margaretha Mueller Fickeisen. Recall that the obituary of his older sister, Carrie Fickeisen Scheffler, also implied that she was a resident of Galion from her birth, and even listed different first names for the parents. Just like his older sister, Abe may have fled Pleasant Ridge for Galion, or, if my mother's story that his wife left him and went to Galion is true, he may have followed her there. The librarian at the Galion Public Library mentioned previously also found tantalizing records from the First United Church of Christ, German Reformed, although they also contain puzzling as well as suggestive information. 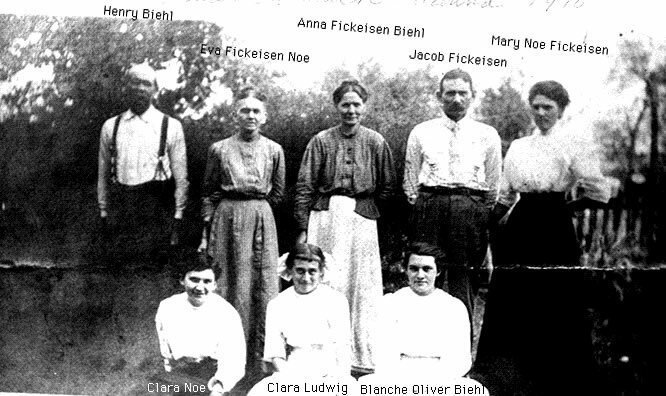 First of all, a Mrs. Katie Fickeisen, wife of Jacob Fickeisen (could have been Abe's other name), was received by the church on June 26, 1910. Furthermore, she took communion at Pentecost in 1915. It is noted that her husband is deceased at this point. Finally, the records state that a Cleora Maud Fickeisen was confirmed May 23, 1915. Cleora, we know, was Abe's daughter, and was in communication with our family throughout the 1950's. It seems to me that these facts are so strongly suggestive that our family may finally put to rest in their own minds the final resting place of Abraham Fickeisen, Jr.
Jacob (1868 or 1869) is listed as 2 in the 1870 Census and as 11 in the 1880 Census. Since this same discrepancy exists for Abraham, Jr. also, I suspect that the 1880 Census was completed significantly earlier than the 1870 Census. He married Mary Noe (distant cousins, another branch of Noes) settled out to Germantown. They had no children. He moved to Marietta some time after he and Aunt Mary got married. He worked in the brick yard until his foot got cut off. He had to have a wooden foot. Then he became a carpenter because brother John taught him. He built 23 houses in Norwood, Lorene can show you every one of them. Put a lot of gingerbread on houses, very skilled. Cut it out themselves. He was 86 when he died. Recently my mother told me quite a bit about Jacob and Mary Noe. They lived on Woodland, 2nd house from corner on the right as you go from Phillips to Kenwood. After mom's father died, she, her mother and grandmother lived with them for almost a year in the back part of their house. They had a kitchen without water downstairs and a room upstairs with no stool. Mary was particular and peculiar, mom thought, but very pretty and well dressed. It was the fact that Mary made mom stay out on the porch until she got a cold that prompted Eva to tell Clara that they had to move. So Clara got a job at the A.L. Savage cigar factory and an apartment for $11 a month at 119 St. 4th with 5 rooms and a bath. "Uncle" Charlie (1870-1937) Charles Fickeisen was born on Pleasant Ridge on Nov. 12, 1870, according to his obituary. He was listed as 9 years old in the 1880 Census. He was confirmend in the Ludwig Lutheran Church when young. 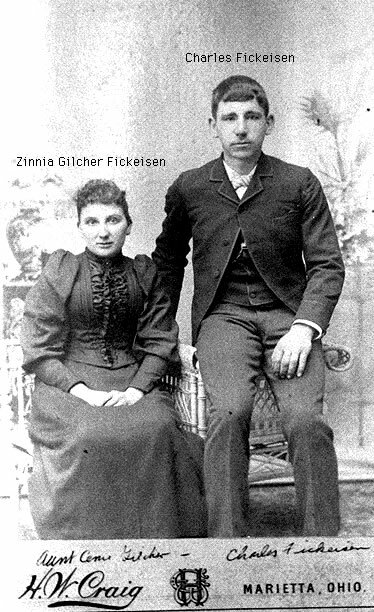 He married Rosena Gilcher on Dec. 24, 1892. They were farmers. According to mom, the biggest house in Whipple, Ohio used to be his. 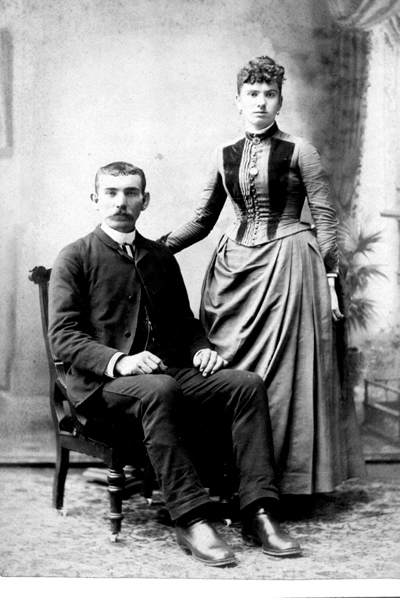 At the time of his death, his wife was alive and "three sons and a daughter, Freeman Fickeison of the family home at Whipple; Forman Fickeisen of Whipple; Harmon Fickeisen of Akron and Mrs. J. M. Farson of Marietta. A daughter, Mrs. Norma Fickeisen Erb, died a few years ago. A son died in infancy. There are eight grandchildren." Freeman married Edith Marie Campbell daughter of Margaret Myers and James Campbell on 25 Aug 1917. 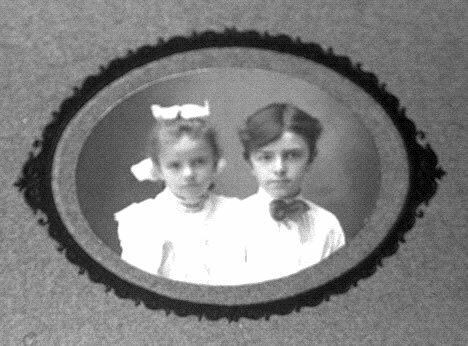 Freeman and Forman killed themselves at separate times. Naomi married an Erb, had some kids. 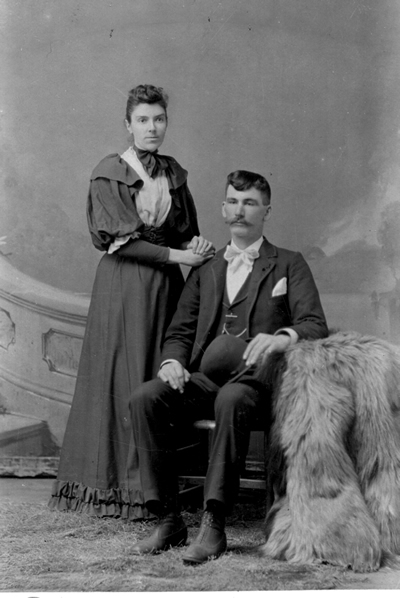 Dora married Joseph Farson on 4 July 1914 and had two daughters, Phyllis and Betty. Mom says that Charlie drilled a well or two. He found some oil on the 40 acres. The obituary states "Mr. Fickeisen had been engaged as a carpenter and had also worked in the oil fields of Washington County. … He was one of the early members of Whipple Grange and had held office in the grange." Charlie played in the Cow Run Band. 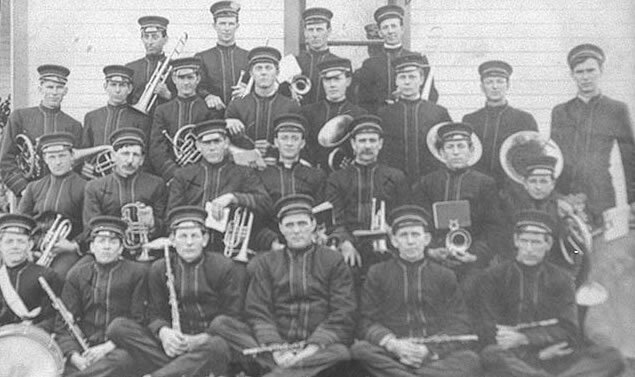 He's the second from the left in the second row back. 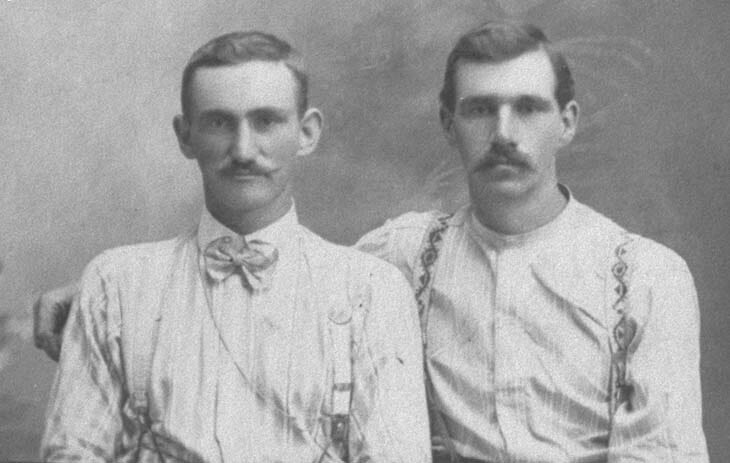 "Uncle" Dan(on the left) (1873) was 7 years old in the 1880 Census. Dan played the stringed instruments, said that he "wasn't windy." The 1900 Census shows him living with his mother Margaret and lists him as head of the house. He married Margaret Burris. Mom has his marriage certificate, which is dated November 4, 1908 and signed by N.E. Kidd, J.P.He had one daughter, Lula on June 20, 1911. Dan did carpenter work along the way. My mother says he built cabinets for lots of folks out on Pleasant Ridge. I have a coat tree made by him. According to mom, Old Nell Weinstock (used to play the piano down at the Eagles Lodge) found Lula almost starved to death, because Mildred left with some guy when Uncle Dan was on a trip. Finally in the summer of 1911, Uncle Dan came down there and wanted Clara, mom's mother, to take Lula and raise her. Frank, Clara's husband, had a violent reaction to this request. Clara was pregnant with Lorene at the time. Eva said, "Why don't you go out to Annie; she doesn't have a family?" Annie and Henry took both Dan and Lula in and they stayed there until 1940 when Blanch and Irvin came back. They kicked Dan out and he lived in an abandoned school house. We took food out to him even when Tommy (my brother) was a baby. Finally, Lula went to the welfare and they found Dan a place to stay a rest home in Whipple. She was adopted. Lula Fickeisen, their daughter, died of drink. She wasn't found for three days. The police found her. She had no children. Modified by Jim Andris, February 6, 2002.